Penguin is a species that has a very unique life expectancy. But here is a exciting story from South east coast of Brazil. A penguin making companionship with a retired brick layer named Joanne De Zoysa. This friendship which started from 2011 lasts till today. Mr. De Zoysa had fed the bird with sardines back in 2011 when it was lying on the beach catching cold. Ever since then the bird comes back to him after going 4 months of coasting which is amazing and miraculous for even to the local fishermen. 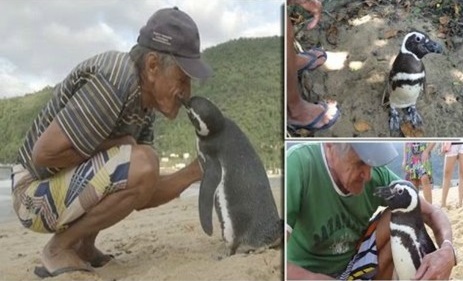 JInjin named penguin is coming from a penguin family which loves to migrate and lives in cold water the most, even though the Brazil coast seemed quite warm Jinjin manages to visit Mr. De Zoysa during its intervals. This friendship gives a good example of living with nature. A species which has less knowledge upon relationships still copes to pay its gratitude over the retired man. This is amazing but true.